It enhances your study experience and maximizes your study efficiency by focusing in on the mathematical concepts. And you get more than just a list of the formulas. You also get explanations of the rationale behind them, so you can do the math and interpret results. Your PMP® Exam Formula Study Guide gives you a lot more than just a list of the bare bones formulas like so many other PMP® prep books and on free PMP® prep websites. We know that you need more! You'll get The Formula Guide, The Formula Pocket Guide and The 105 Sample Questions. They are all in PDF format. This formula guide is complete, easy to understand, includes sample questions and a pocket guide and has been used by over 6,000 students so far! In short, this is it! You'll study, know and practice the correct PMP Exam formulas. No research needed. Save time. This is the authoritative guide to all PMP Exam formulas. 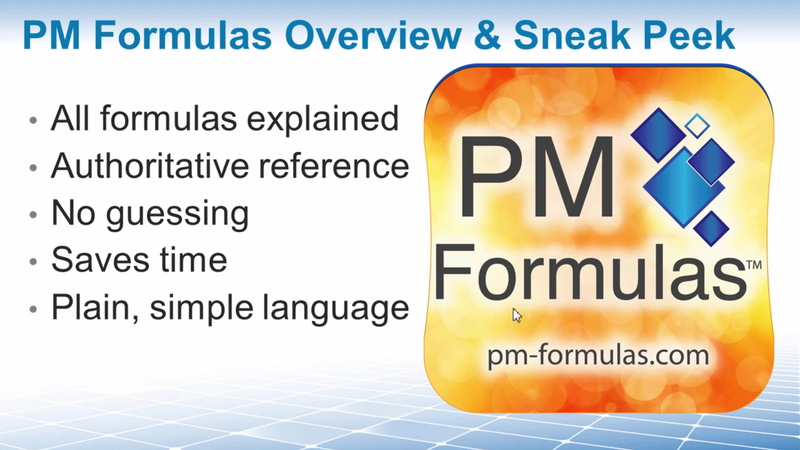 The PM Formulas are a simple way to study complex PMP concepts. The best way for you to internalize all the required PMP® Exam Formulas is by answering as many formula based questions as possible. That is why you receive a 90-page PDF document that contains 105 Free PMP® Exam Questions that allow you to practice. These questions not only test if you know the formula, but they also test if you are able to apply the formula. The PMP® Exam Sample Questions that you receive in this document have been created specifically to help you learn the formulas and values that you need to know. It contains the following question types: Apply one formula, apply two formulas, invert then apply a formula, result interpretations, identify the correct formula for a specific problem, and finally questions that contain keywords for which specific formulas must be applied. Anytime & Anywhere. Right In Your Pocket! "Print it - Fold it - Study Wherever You Go." This is the motto of your Formula Pocket Guide and Cheat Sheet (Some people refer to this as a PMP® Exam Brain Dump Sheet). This is a one-page PDF document, which contains just the bare bones formulas, important values and acronyms that you need to know. For easier reference you find them grouped into the following categories: Earned Value Formulas, PERT Formulas, Communication Formula, Procurement Formula, Probability Formula, Network Diagram Formulas, Project Selection Formulas, Depreciation Formulas, Mathematical Basics, Important Values to Remember, and Acronyms to Remember.